My best friend and her daughter were over from the UK and we decided to stay at Heritage Village Villa 1. We all remarked that this was the best place for us. Thank you. Hi there we arrived and thought the villa looked great, easy location to get to and from the show. However we where not informed there was a wedding venue right next door with loud music playing till midnight both Friday and Saturday night which was a bit of a nightmare especially when we where having to get up early. A shame as the villa itself was great. The house is on a quiet and beautiful section, not too far from the town centre. 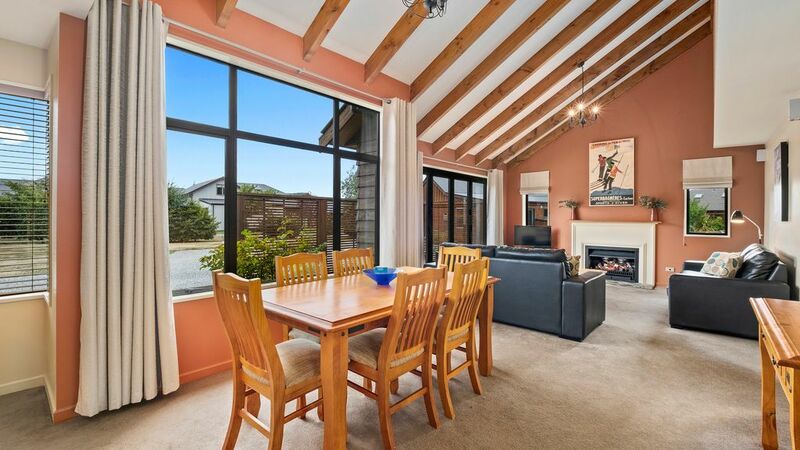 It has everything you may need for a relaxing holiday in Wanaka. It even has a tennis court. Good indoor-outdoor flow. The patio transitions nicely into the large lawn with young trees. Inside is pleasant too. It was mainly clean, apart from some half-cleaned cups and dishes in the pantry and a dirty cutlery drawer. A few more sharper knives could be added to the kitchen utensils. Minor niggles at first: insufficient attention to detail on previous clean; hob greasy; coffee machine not cleaned; mats dirty; vacuum cleaner full; frying pans broken; light bulbs broken. Chris resolved issues promptly. Otherwise property and location were great. Good views, good facilities, clean. Improvements that could be made: better lighting in lounge; tennis racquets - we left some from the op-shop. Wifi fee seems excessive. We really like staying here. But for the price, a decent supply of essential items would go a long way to making the stay a lot better. Toilet paper, salt & pepper, dishwasher powder, laundry powder etc supplied in minimal quantities - so on a stay over 2 days, a trip to the supermarket to stock up on the stuff you don't want to tale home with you, is required. The Villa has everything needed and nestles into the most superb scenery.